An impacted tooth is a tooth that is “stuck” and is unable to erupt into function. The Canines are also known as the “Corner Stone Teeth” of the mouth because of their position and role they play in functionality. When it comes to impacted canine teeth, patients may have many questions regarding what they are and how they relate to their health. This article serves to answer those questions. We consider a tooth “impacted” when it fails to grow into the correct position by being unable to erupt through the gum line. Impacted teeth can either be completely unerupted (buried and invisible below the gum line) or partially unerupted, in which case a part of the tooth will be visible in the mouth. What Does An Impaction Mean In Terms Of Health? A full-functioning and healthy mouth will have all of its teeth in healthy alignment. One or more impacted teeth can affect the function of the mouth as it opens and closes as well as creating an uneven and unaligned appearance. There is some debate on whether you should treat all impactions or not. Although impactions are not life-threatening, they can often cause a lot of pain and discomfort for patients that experience them. An additional issue that impacted teeth can create for someone is opening small gaps in the mouth that can invite nasty side effects such as infection, decay, gum disease, and dental cysts. The solution for impacted teeth is usually braces or surgery. Canine teeth are the sharper teeth in the lower and upper jaw. An average adult will have a total of 4. The reason we call them “canines” is because of their pointy and sharp appearance that also resembles fangs. Because of their distinct appearance and functionality, dentists and orthodontists will often recommend fixing issues regarding canines to give the patient proper alignment, look, and function. When Do Adult Canine Teeth Appear? Usually, the adult canine teeth come into the upper jaw (also known as the maxilla) erupt into the mouth between ages 11 to 13. Prior to coming in, you can sometimes feel them as incoming bumps beginning to form on the gum line. What Are Some Potential Canine Teeth Issues? Because of the cycle of losing our younger teeth and replacing them with newer teeth, one or both of the canines can either come down in the wrong position or not erupt at all. This would be classified as an impacted canine tooth. Luckily, dentists and orthodontists have the ability to detect any current or future problems with the canine teeth around ages 10 to 14 years old, in which they will recommend treatment and the best course of action for a patient’s specific situation. What Causes Canine Teeth To Grow In Incorrectly? The main cause of canine teeth growing in incorrectly is genetics. Believe it or not, some people never grow some teeth at all, which may be a genetic condition. Others have issues with the size of teeth, alignment of teeth, or problems with too many / too few teeth. Issues like these can be from things like teeth genetics and facial trauma or other things like jaw position and placement. What Does A Misplaced Canine Tooth Look Like? This is completely situation-dependent. 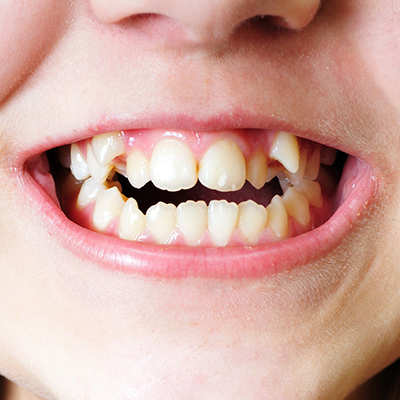 Sometimes only one canine tooth grows in incorrectly, while at other times, both of them become impacted. In most cases, the impacted tooth (or teeth) creates a gap between the incisors and premolars and it can be very noticeable. Alternatively, they can both erupt at the proper time but still, come in sideways. What Happens If A Canine Tooth Grows In Incorrectly? If one of your canine teeth grows in incorrectly, your treatment options will depend on the severity of your conditions as well as your age. Your dentist or orthodontist will be able to explain all of your options for you, which may include surgery. What Happens If I Leave My Impacted Canine Tooth Untreated? The tooth may begin to grow behind other teeth in the mouth, leading to crowding. The impacted tooth may cause a gap in your mouth, leading you to seek out either dentures or a bridge. A cyst may form around the crown of the buried tooth, causing pain and crowding. It should be understood that if you currently have an impacted canine, surgery is not absolutely necessary. But, it is a guaranteed way to get rid of the current problem and potential problems down the road regarding your impacted canine. Additional information on impacted canines can be found on the New York Oral & Facial Surgery website. Who Performs Surgery On Impacted Canines? The type of surgery you will receive for your impacted canine depends entirely on the expertise of the professional you’re visiting as well as the severity of your current situation. If you are referred to an oral surgeon such as Dr. Alan Chun, then we will work closely with both your dentist and orthodontist to ensure the correct measures are taken to remedy your specific situation. This includes providing you with the proper aftercare once the procedure is completed. What Happens During The Impacted Canine Surgery? Removal and discarding. If the buried tooth is in a poor position for re-alignment removal and discarding may be necessary. We might also recommend removing a tooth if it is showing signs that it may be problematic to adjacent teeth. In most cases, this minor operation only requires local anesthesia. Re-alignment if the tooth is exposed. In some cases, if part of the tooth is exposed in the mouth, your dentist or orthodontist can re-align it. This will require the patient to wear some type of temporary anchoring device for up to 2 years. Transplantation. If re-alignment isn’t possible, but there is space between other teeth, then transplantation might be the best option for you. This involves removing the tooth and placing it in the correct position. After that, the dentist will splint the tooth for about 2-3 weeks. If you or someone you know is currently experiencing problems regarding impacted canine teeth, give us a call at (925) 833-8516 or contact us.